The legacy of the Dunsfold Harriers goes far and wide. 50 years on, and the Harrier is still flown in American skies. Significantly the point is made that the Harrier was the only non-US aircraft used by the US Military since World War 1. 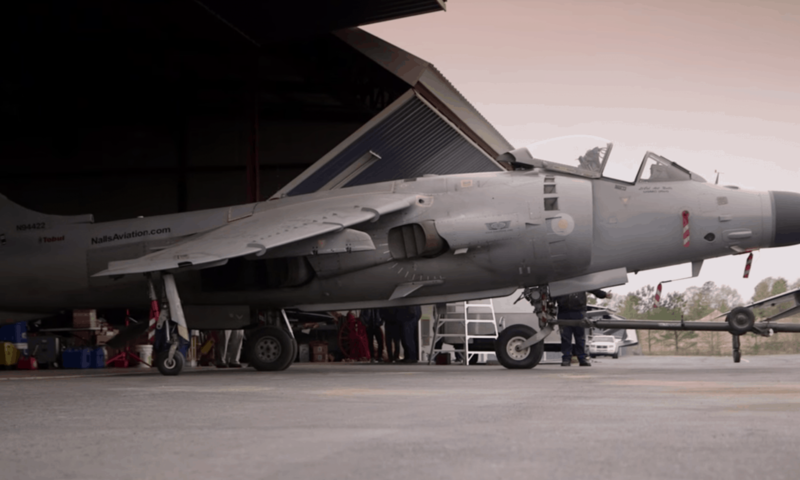 This story shows the passion of one man for the Harrier. Art Nalls has had a life long dedication to flying. His addiction to the sky has lead him to an honourable military career and an even more adventurous retirement. 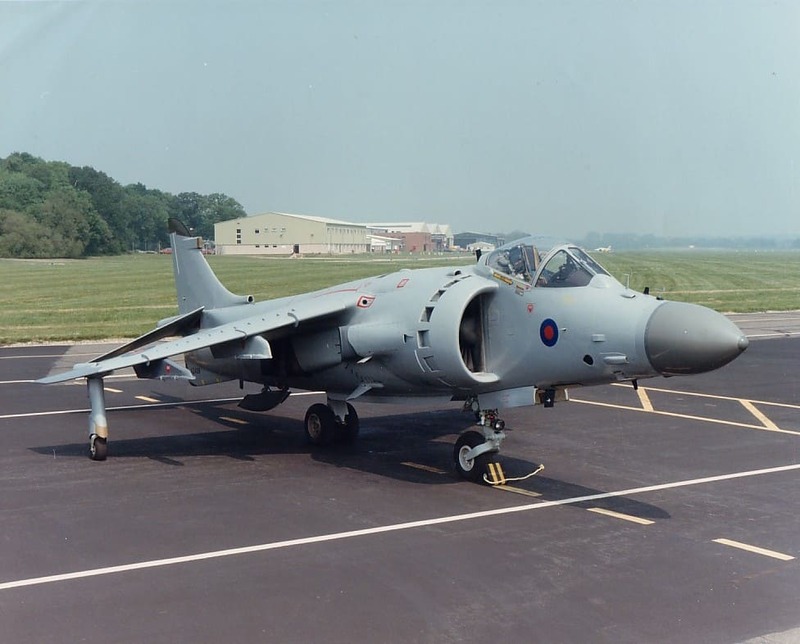 Nalls has had the unique opportunity to purchase his own British Harrier Jump Jet. Now this retired Lt. Col test pilot uses his passion for flight to help preserve military history with the maintenance and upkeep of the last three remaining Sea Harriers. XZ439 early history: BAe & A&AEE development aircraft. First aircraft to ramp launch at sea on 30 Oct 1980. Delivered to RN 19 Apr 1982. Converted to FRS.2 (FA.2) in Oct 1989 as second development aircraft. Shot down three QF-106 drones during AMRAAM trials in 1993. Departed St Athan by road 11 Nov 2004 to Everett Aero at Sproughton. Sold to Art Nalls who plans to fly the aircraft in the USA. Shipped from Seaforth Docks during Feb 2006. Allocated US civil registration N94422. Made its first US air show appearance 11 Oct 2008. A beautiful photo of XZ 439 as she looked when new! We’re doing our best to preserve her and keep her in the skies – -safely. Yesterday, 14 May 2017, we returned from the Pittsburgh, Pennsylvania Airshow where we did an unusual demo. We raced a supped-up Ford Mustang from a standing start. I used normal ‘dry’ settings and set up for a conventional takeoff. The Mustang even jumped the gun, but XZ 439 beat him to 100 mph! We smoked past him before he was out of second gear! I then circled around one time for our high speed pass and easily topped 565 knots, only a minute or two from a standing start. The SHAR can really get up and move! Thanks for calling by. I have posted above some video of your Pittsburg display. XZ 439 was part of the family at Dunsfold and she has a history in her early years. Some of our other members know her very well, and will surely expand on her upbringing! Love the Harrier as an aircraft with many things normal aircraft can’t do. Your comment that the Harrier was the only non US made aircraft since world war 1 used in US forces is not correct. The US used and flew Photo Recon in Spitfires and Mossies with US markings on them. They also may have eventually licence-built and called it something else in mass production, but they bought and used a few Canberras. XZ439 was one of the initial development batch, and since the retirement of the modified Indian Navy FRS51’s is the last flying Seajet. The Mid-Life Update FRS2 – with the Ferranti Blue Vixen radar ( said to be the best fighter radar in Europe, second only to the F-15’s AN/APR63 ) and Hughes AIM120 BVR Beyond Visual Range AMRAAM missiles was a formidable fleet defence interceptor, so why it was scrubbed remains a mystery best known to the Admiralty. The initial FRS2 with cheek pitot probes – as shown on my shot here of 439 – had a P.E. problem with the altimeter reading dangerously high compared to the real ground – discovered by Test Pilot Simon Hargreaves during a trial at West Freugh, so the modified FA2 as XZ439 is now, has a pitot probe on the fin. The ‘ FRS Fighter / Strike Reconaissance ‘ designation was also deleted, much to my and I expect service photographers relief; the F-95 recce’ camera in the Sea Harrier was on the starboard side, rather than to port as in the GR1/3, so was fitted upside down.